Waianae Public Library would like to publicize the second of two programs to be held at Waianae Public Library this Saturday, November 23, at 10 AM. 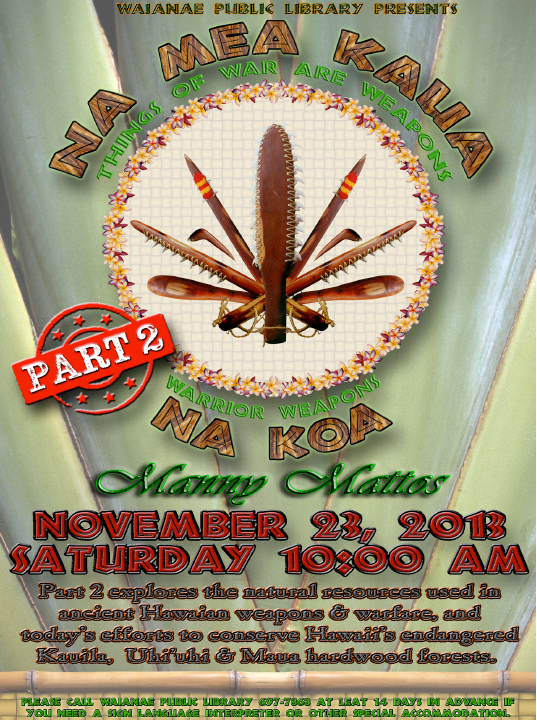 This program is entitled “Na Mea Kaua, Na Koa, Part 2” and is a presentation by Mr. Manny Mattos on the natural resources used by the ancient Hawaiians to construct weapons and other tools. This second program will feature Hawaiian hardwoods and explore today’s efforts to preserve the endangered resources. This program is free and open to all. Mr. Mattos is an expert in the construction of ancient Hawaiian weapons, including shark-tooth edged weapons, and he is involved in the preservation of Hawaii’s endangered hardwood forests. Mr. Mattos has presented this material in several previous programs at Kapolei Public Library, and many of the enthusiastic comments received from patrons came from Waianae residents who asked for more of this type of programming for their community. His first program at Waianae, held on October 26th, had a good turn-out and was enthusiastically received by Waianae patrons. Please direct any inquiries regarding this event to me, Casey Jones, at Kapolei Public Library. Next articleTurkey rescue: more guts than brains?